Queenscliff started the game as the better team and continued to pressure up until half time. 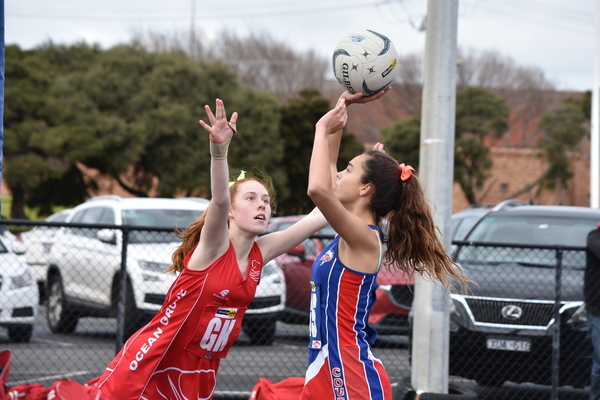 Ocean Grove found their strength after that and went on to win by 13 goals. The 17/2s had a great win under the lights on Wednesday night. They worked well as a team and managed to beat their opponents on the court, giving them good confidence before their final against Amos next week. It was a bit of a slow start as both teams got used to playing on the wet courts. 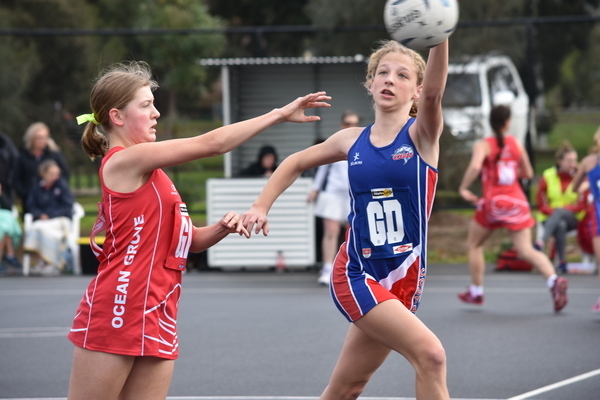 Queenscliff played well, threatening the Grubbers for the first half but it was Ocean Grove’s game after that. They finally got themselves up to their usual standard to take the game by 17. 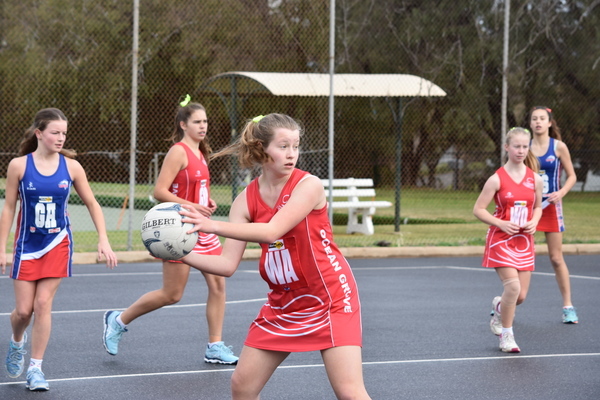 The Ocean Grove 15/2s took a huge win at home this week against Drysdale. Their defence did a great job of gaining turnovers which the attackers then used to convert to their final high score. After a good season, they have finished 3rd and will play finals next week. The under 13/1s finished off their season with a good win over Queenscliff. They came out hard and dominated for the first three quarters but Queenscliff remained determined and pushed right up until the end. Ocean Grove was too good and were able to finish off their year with a positive. It was another great win for the U13/2s this week. They played well as a team and they will now prepare themselves for their finals pursuit starting next week against Barwon Heads. It was a tough game for the U17/1s this week. Ocean Grove came out hard to claim the upper hand early in the game, which meant Drysdale were the ones chasing them. Despite some good play from their opposition, the Grubbers were too good again and took the win by seven. It was a close first half, with only three goals separating the sides at half time. Ocean Grove really picked it up from there, showing their true skills and dominating the second half. It was a great match for the girls to prove themselves before finals. It was an easy game for the U15/1s as they took on seventh placed Drysdale. The played well, controlling all areas of the court and making it extremely hard for their opposition to move the ball. 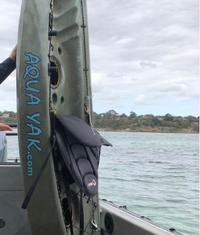 It was a good percentage booster for the Ocean Grove team. It was a good win by the U15/2s. They played well in the first half but it was the third and fourth quarters that saw them really dominate. They managed to keep Drysdale to only one goal for the whole second half whilst they continued to score point after point. It was an extremely tough game for our U13/1s They started off really strongly, going goal for goal with Drysdale. Unfortunately, a few turnovers saw Drysdale take a three-goal buffer over them at half time. The Grubbers played hard but just couldn’t quite make up the points they’d lost and ended up going down by four. Another round done and another win for the U13/2 girls. They are proving that they are definitely a team to watch as they prepare for the upcoming finals. The girls started off slightly slow against Drysdale but pulled themselves into form and took the win by 14 goals in the end.